Here is the issue one variant cover. Hopefully this hasn't been posted anywhere else. If it has, bad me. Love it! But is that a demon or a dinosaur? I like it 10 times better than the other cover! The other cover is great but something about it is a bit off in my oppinion. This one is amazing though!! I really love this cover. I wish I had gotten this one. When I guy at Elite Comics held it up it looked less than appealing. But looking at this image, it looks awesome. The thing is a demon. I wanted both covers but only got this one...due to the sell out!!! Oh well at least got the one I liked the best...my comic shop is always hooking me with variants...hope I keep finding 'em in my pull box! I got both variants. I just wish she looked more like SMG. I'm not that impressed so far. I WISH Jo Chen would do a panel or two of interior art! That would be so cool!! I only had enough for one, and didn't expect them to have this cover, but unfortuantly, they did, so I had to choose which one, but I was just in shock that the first issue was right in front of me so I said, "Doesn't matter." So I got the Jo Chen one, which I do like better, but they only had one of Georges's and like 20 of Jo's. I scored with the comic shop guy cause he only had a few variant covers as well. But he said since I was the first person there to buy them I was lucky. He held one for himself, I took one and I think there were only two more. No way...she deserves a full arc!!! But some panels do look like SMG, others....eh...not so much, but it can be incredible difficult for an artist to not only capture an actors likeness but also be able to convey emotion...there is usually a trade off! It would take Jo a year or more to do a full arc. Her covers are very time consuming. She could do a panel or two, which would be great. Like in Staked Through the Heart, which was a mix between basic comic book art and lavish, beautiful pieces. So she better get started, this thing will run well over 2 years!!! So there isn't an excuse!!! Just look at Alex Ross and Gabriele Dell'Otto's work in comics...it can and should be done!!! Why are her muscles so HUGE? It's gross! Hitnrun...Hmmm...I thought they were 50/50 split. This leads me to believe Georges may be much rarer!?! The comic store could of had more. But they had like 3 piles and no Varient, but mine was behind the counter cause it was on hold, and he brought out another pile and there was only one Varient. there is a even rarer cover its a variant of the variant cover. its is just the drawing of the cover and only 1000 of them printed. I seen them on ebay going as high as 60 and 70 bucks!! I love the sketch variant, I'm going to try to get it on eBay. They didn't have any variant covers at my comic book store. I ordered it from tfaw.com but it hasn't even shipped yet and it says it takes like 30 days to get to Canada. I'm hoping that is an overestimate of time. Hmm, it's nice, but I do prefer the regular cover. Only, I can see this in the future for being a very rare comic book indeed. If Buffy S8 is going to be as popular and as huge as I think, then I can see the first issue, especially the variant, for being collectors pieces some day. I love this cover and I too wish that it resembled Sarah more. I need to get this, I hope that I can get a copy somehow. Off Topic, willowswarlok I love your banner. I love BONES. 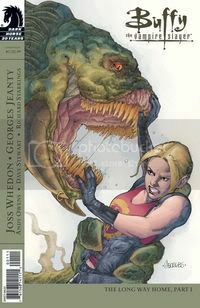 When I saw Georges Jeanty's cover to Buffy #1, immediately Matt Wagner's cover to Batman and the Monster Men #4 came to mind... what do you think? Are these covers similar or what?